Considering the AGM of 2017 was a glum affair full of warnings about the potential financial demise of the Society and, since then, two shows had both registered a loss, the meeting of 2018 was surprisingly upbeat. In addition to that, the DYT committee had decided to break from SOS (rebranding themselves as Dynamic Youth Theatre) leaving the Society with the name of a youth group but little else. However, important decisions had been made during the year and it had been resolved to cease hiring the expensive Nursling Scenery Store and to move the rehearsal venue to the significantly cheaper Bitterne Park Sixth Form Theatre. 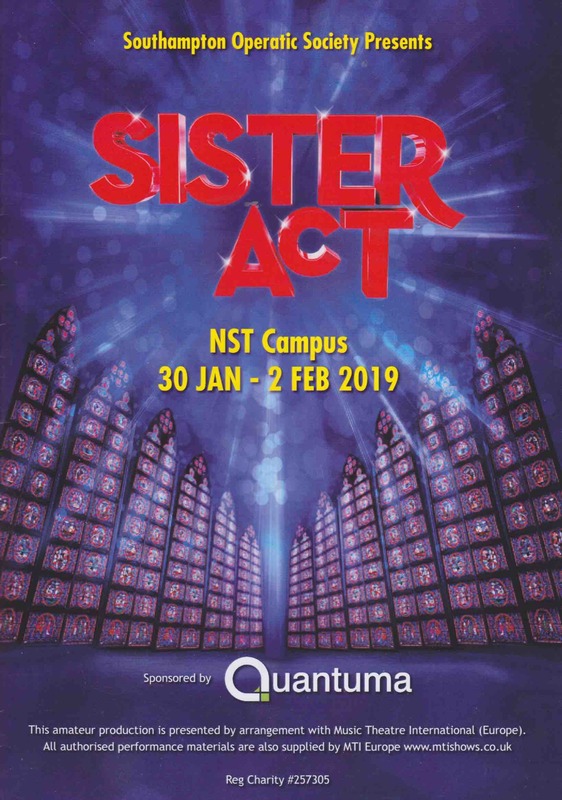 The choice of Sister Act as the winter show was generally a popular one but there was still an element of risk in its selection as Eastleigh had recently made a loss on their production. At 28, Rachael Pike became the second youngest SOS Director (David Tatnall was 23! ), she had planned the show thoroughly and it was far from obvious that she was making her debut in that role. Her husband, Matt, helped as Assistant, Susie Maycock was the Choreographer and the very experienced Nigel Finch the Musical Director. The reviewer also highlighted some outstanding performances from the principals, ‘As Delores, Susie Maycock is in top notch form both in energy and vocal talent. She has excellent stage presence with a warmth and passion that gives her Delores a sass and ‘vavavoom’ needed, the character barely being off stage. Very impressed with her throughout. Matching her with vocal talent and great characterisation is Tina Adams as the Mother Superior. A difficult role which is elegantly played with just the right touch of humour, worry and faith confusion, balancing all these perfectly. Indeed all the Convent Nuns played their roles with energy and pure joy, Abi Jeffrey and Jo Barnard being particularly marvellous to watch. As Sister Mary Robert, Abi Jeffrey just caught the essence of this character so well, making her huge solo number even more emotional and wonderful. The audiences were indeed appreciative but the total number for the week (1460) would not necessarily guarantee a financial success. However, avoiding having a Get In on the Sunday, not performing on Tuesday and a greater than usual consideration given to ticket pricing has seemingly led to a much-needed profit in the region of £3000.